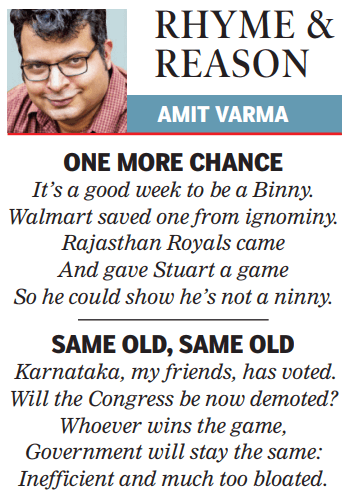 This is the 79th installment of Rhyme and Reason, my weekly set of limericks for the Sunday Times of India edit page. It’s a good week to be a Binny. Walmart saved one from ignominy. So he could show he’s not a ninny. Karnataka, my friends, has voted. Will the Congress be now demoted? Inefficient and much too bloated.